This is the greeting among Byzantine Catholics and Orthodox during the eight days of the Theophany/ Epiphany, which begin on January 6. The ceremony of the Blessing of Water is done in church and also outside at lakes, rivers, and the sea. It is one of the most impressive ceremonies of our Church. Be sure to scroll all the way down to see all the icons I have posted. It is the custom to open up the frozen river to bless the water, and to put up a cross of ice at the spot. Tomorrow is our great feast of Theophany. Jesus enters the Jordan River, and is baptized by John the Baptist. 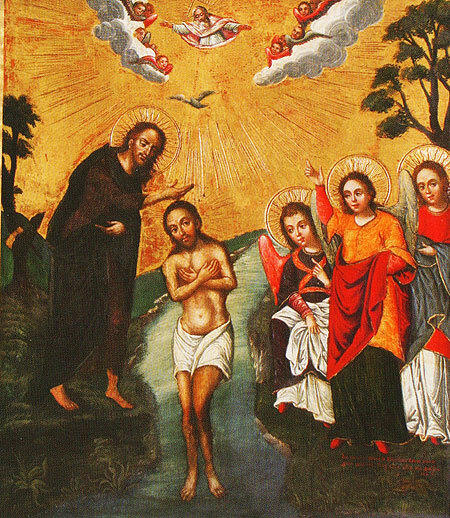 A voice from Heaven calls Him “My beloved Son”, the Spirit descends “like a dove”, and the God-Man submits to baptism though He has no need of it. his is the manifestation of God. Specifically, the Father speaks, the Spirit descends, and the Son is baptized – the entire Trinity is revealed on earth! And this is the day of the Great Sanctification of Water. Take your holy water home with you, and bless your house – at each door, and in every room. Simply say “This house is blessed with the sprinkling of this holy water.” Later the priest can come and do it again with the power of the priestly blessing. Enjoy tomorrow – one of our most important days! 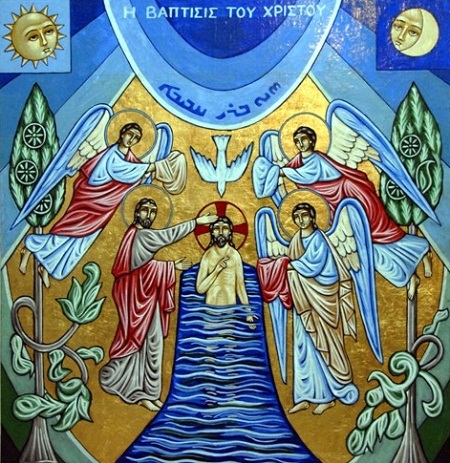 God the Father appears above in the circle of the Eternal Trinity, the Spirit descends in the form of a dove, Jesus humbly enters the water. John, dressed in rough skins, obeys and pours the water on Him. 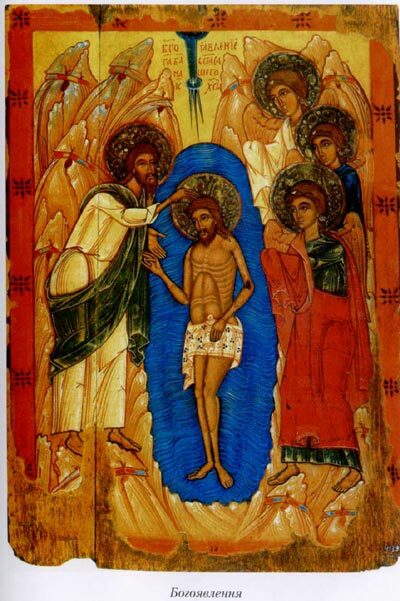 The three archangels wait to dry Him off. This is an old Ukrainian icon (God the Father is not supposed to be shown, but this would happen after the mid-18th century). An older, and more traditional Ukrainian Icon of the Theophany. The Holy Spirit is in the center of the three rays coming out of the circle of the Trinity. There are three because the Logos, the Eternal Word, remained in heaven while still giving Jesus Christ His divine nature. Here is a beautiful example of the icons created in the villages. Despite the rustic style, it is from 1900-1918, not earlier. This is a modern Maronite icon. The Syriac and Byzantine styles are similar. It is worth noting that the archangels’ hands hold towels both to bless Jesus, but also out of respect for His sacred Body so that they would not inadvertently touch Him. An old Russian Icon, with the three archangels lined up in a row to honor Jesus. God the Father appears above, with the Spirit descending. This western change to traditional icons appears as early as the 18th century in Russia, the approximate time of this venerable icon. « Christ is born! Glorify Him! CHRISTOS RAŽDAJETSJA! SLAVITE JEHO!